Posted on 28, March 2016 by EuropaWire PR Editors | This entry was posted in Automotive, Financial, Germany, Industrial and tagged Dieter Bellé, Leoni. Bookmark the permalink. Nuremberg, 28-Mar-2016 — /EuropaWire/ — Leoni, the leading European provider of cables and cable systems to the automotive sector and other industries, generated substantial sales growth to EUR 4.5 billion in 2015, which is a year-on-year increase of about 10 percent. Of this gain, 5.5 percent stemmed from the Company’s own resources, with increased demand from both the automotive sector and numerous other industries. Earnings before interest and taxes (EBIT), however, dropped to EUR 151.3 million (previous year: EUR 182.5 million). This was due mainly to higher-than-planned expenses relating to new projects in the Wiring Systems Division in the third and fourth quarters. The figure furthermore includes non-recurring income of EUR 19.6 million from the sale of a share in a plant. Consolidated net income amounts to EUR 77.3 million (previous year: EUR 115.1 million). Leoni intends to pay out a dividend of EUR 1.00 per share (previous year: EUR 1.20). The Group has prepared a comprehensive package of measures, implementation of which has already begun, to boost profitability on a long-term basis. “2015 was a challenging year for the Company. Sales performance was encouraging, but earnings were disappointing. We are giving top priority to resolving the problems in our Wiring Systems Division: we have applied measures to achieve a sustained increase in efficiency,” said Dieter Bellé, President & CEO of Leoni AG, at the group of companies’ balance sheet press conference. The Wiring Systems Division (WSD) increased its sales by 11 percent to EUR 2,668 million during the year under report (2014: EUR 2,400 million). Sales to the export-heavyweight German carmakers recorded a particularly substantial increase. The WSD maintained its globalisation strategy by opening its fifth plant in Tieling, China, agreeing a joint venture in China and opening a production facility in Paraguay. The division furthermore succeeded in gaining the Asian carmakers Hyundai and Geely/Volvo as customers; in total, the division booked orders worth EUR 4.1 billion during the year under report. The first aim is to raise the performance of the projects that are the principal cause of the adverse effect on earnings. Secondly, Leoni will improve processes in project planning and implementation. The third element is to streamline the matrix organisation to facilitate short decision-making processes, clear responsibilities and lower costs. The package of measures will lead to a sustained increase in profitability, but in 2016 it will incur restructuring charges of approx. EUR 25 million. The Company has budgeted fiscal 2016 sales of EUR 2.6 billion and EBIT of EUR 30 million for its WSD segment. The Wire & Cable Solutions Division (WCS) benefited during the period under report from the still heavy demand for automotive cables as well as good performance of the business involving cables for industry and the healthcare sector. Sales were up by 8 percent to EUR 1,835 million (previous year: EUR 1,704 million). Having opened two new automotive cable plants in China and Mexico during the year under report established the conditions for further growth in Asia and the Americas. Adverse foreign exchange rates, a lower copper price and write-downs on receivables exerted a diminishing effect on earnings – especially so in the 4th quarter. The division’s EBIT amounts to EUR 63.9 million (previous year: EUR 78.1 million). With the aim of strategic further growth, the division will sharpen the focus of its market activity and to that end will look into consolidating its portfolio. In addition to further strengthening of its position in the automotive cables market, the agenda includes expansion of select segments of industrial business. This will involve stepping up development towards being a solutions provider. For the 2016 financial year, Leoni projects WCS Division sales of EUR 1.8 billion and EBIT of EUR 75 million, with this figure taking account of EUR 5 million in restructuring costs. In the 2015 financial year, Leoni again invested heavily in property, plant and equipment as well as intangible assets in the record amount of EUR 247.5 million (previous year: EUR 215.8 million). Key projects outside Germany involved setting up the fifth wiring systems plant in China and constructing the first production facility in Paraguay as well as commissioning two new automotive cable plants in China and Mexico as well as a special cables production line in Eastern Europe. In Germany, the Company invested above all in the second modernisation phase of its Wiring Systems Division headquarters in Kitzingen, expanding production of high-speed data cables in Friesoythe as well as purchasing the site for the Factory of the Future in Roth. Leoni’s financial and asset situation continued to present a solid picture in 2015. Equity was up by about 9 percent to EUR 996 million at yearend (previous year: EUR 918 million), while the equity ratio rose to 35.1 percent as of the reporting date (previous year: 34.4 percent). Leoni reduced its gearing from 34 to 32 percent. Due to the modest slowdown in the economies of the markets relevant to Leoni, lower metal prices and the no longer consolidated income from the joint venture in China, Leoni estimates a slight decrease in sales to EUR 4.4 billion for the current year. Alongside missing profit contributions, the critical wiring system projects, which are not generating the expected returns despite the measures initiated, will weigh on the result in 2016. In addition, there will be restructuring and exceptional expenses. Leoni therefore projects EBIT of EUR 105 million. Compared with the previous year, the Company has reduced the amount of capital investment slightly to EUR 230 million. In essence, the 2016 financial year will be marked by improving efficiency in order to return to a course of profit-oriented growth. The Company continues to operate in a very promising setting and has a substantial order backlog in both of its divisions. Further development of structures and market activity will underpin the uptrend. 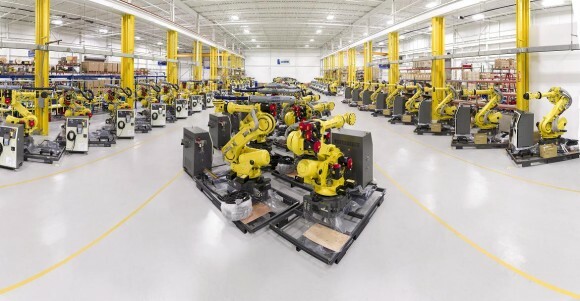 For growth in the region Americas, Leoni counts among others on the production site in Lake Orion (USA) that transforms a machine into process robots ready for integration by means of complex cable assemblies.